A strengthening routine for the upper and lower body. Need a convenient, fast and effective total body workout? Try this routine of resistance band exercises. You’ll challenge the major muscle groups of your upper and lower body. 6 exercise videos and illustrations are included. Hold your torso upright and completely still. Do not lean forward or back. Keep both of your feet pointing forward, and position your front knee so it is centered over your ankle. Do not let your front knee shift forward past your toes. Wrap the exercise band around your hand as needed until you feel enough resistance when you push or pull on it. You should be able to go through the full motion of each exercise without straining. 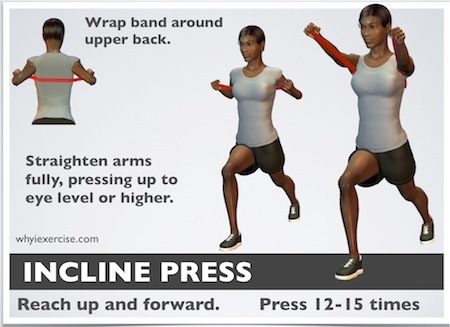 The resistance band exercises begin in a lunge position. Step backward with one foot and lower your weight toward the ground. Stop at the point where you can feel your muscles working. If you want to focus on the upper body only, hold a slight lunge. 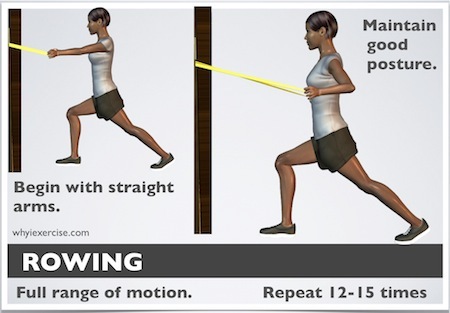 To get a total body effect from these resistance band exercises go into a deeper lunge. You can adjust the depth of your lunge as needed during the workout. Start in a lunge position and hold each end of a resistance band. 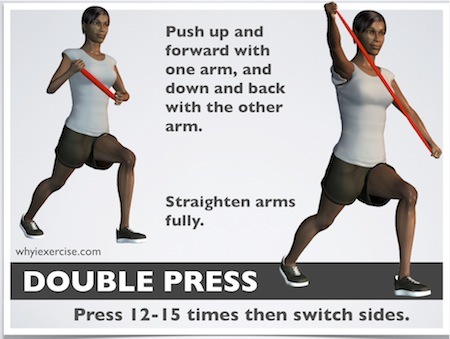 For this exercise, push in opposite directions with each arm as you see in the illustration. Be sure to straighten your elbows all the way at the end of the movement. If you can’t do this, lessen the tension on the band somewhat. Notice that the arm that reaches overhead is opposite the front knee. (Try it, it feels more natural that way.) Press the band 12-15 times, then switch sides. 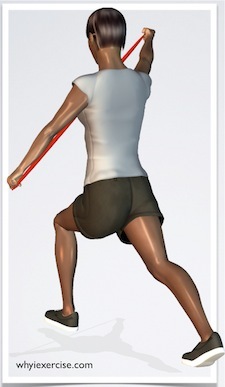 Starting from the lunge position, put the middle of the band under your front foot. Tighten the band as needed and then curl through a full range of motion. Go all the way up and then straighten your arms all the way before repeating the exercise. Take care not to lean back as you curl up. 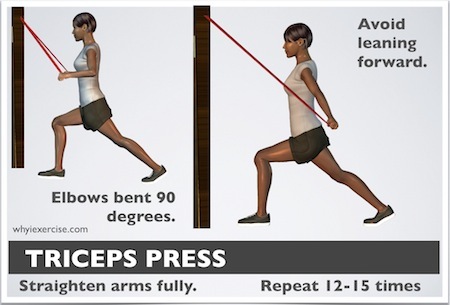 Perform 12-15 curls, and you can switch legs for your lunge as needed. Attach your band at eye level or higher. (Close it in a door or wrapped around a sturdy post or pole.) With your arms at your sides and your elbows bent 90 degrees, push down on the band and straighten your arms all the way. Careful not to lean forward during this exercise. Repeat 12-15 times and switch legs as needed. Attach your band at about chest height (closed in a door or wrapped around a sturdy post or pole). More resistance is usually needed for this exercise, so a heavier band or tube may be helpful. From the lunge position, start with your arms straight out in front of you. Pull back past your torso, bending your elbows, and squeeze your shoulder blades together for maximum motion. Watch that you don’t lean back as you pull. Repeat 12-15 times and switch legs as needed. Wrap your band around your back and under your arms as shown. Tighten the band and drop into a lunge as in the previous exercises. Push the band up and forward at an angle as shown. Space your shoulder blades apart (opposite of pinching), so that you can reach as far forward as possible. Keep your upper body straight and tall during this exercise. Return to start and repeat 12-15 times. Switch legs as needed. Note: you can do the biceps curls with dumbbells if you prefer. Set up the band at eye level or higher. From the lunge position, start with your arms straight out in front of you. Keeping your arms straight, pull back past your torso. Expand your chest at the end of the movement for maximum range of motion. Your arms are out to the side, and you palms face back as you pull. Careful not to lean forward at the end of the pull. Repeat 12-15 times and switch legs as needed. 2 resistance bands about 4-5 feet in length should be enough for this routine, though you may need a heavier band for the rowing exercise. Scroll to the bottom of this page for instructions on anchoring the band. Note: Tubing also works well for most of the resistance band exercises (all but #4). Tie a knot at each end of your band. Secure one end of each band in a doorframe so that the knots are on the opposite side of the door when you close the door. Be sure the door is closed and locked so the door doesn’t pop open during the exercise. If you have 1 long band, you can wrap it around a sturdy post or pole, as you’ll see in the videos. 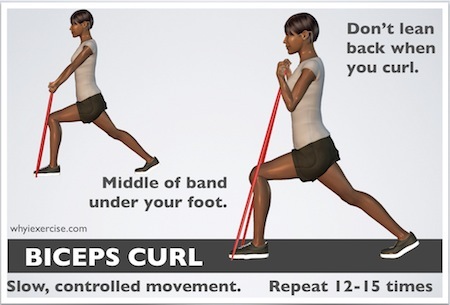 Hope you have enjoyed these resistance band exercises!